A passion for traditional French techniques and a dedication to baking perfection are the guiding principles for Patisserie de Paris owner and founder, Paul Zwick. A career change 10 years ago after 32 years in local and international TV production led to studying classic French cuisine at the Gastronomicom International Cuisine Academy in Cap d'Agde, south of France. After studying, he interned in patisserie at two Michelin-starred gastronomic restaurants in Nice and Lyon. After a year he specialised in advanced traditional French patisserie and graduated from the world's most famous culinary school, E’cole Cordon Bleu in Paris. He apprenticed under one of France's Top 100 chocolatiers. After five years in France and Switzerland, he returned to South Africa and opened at the Bryanston Organic & Natural Market selling artisan breads and crafted pastries twice a week. Demand for freshly baked bread and pastries on a daily basis grew rapidly and Patisserie de Paris opened on Bastille Day 2013 in suburban Blairgowrie Johannesburg. The bakery / patisserie / restaurant has grown from a modest 18-seater to 100 seats. It also houses The French Market, an exclusive deli boutique with France’s finest cheeses and European meats on offer. 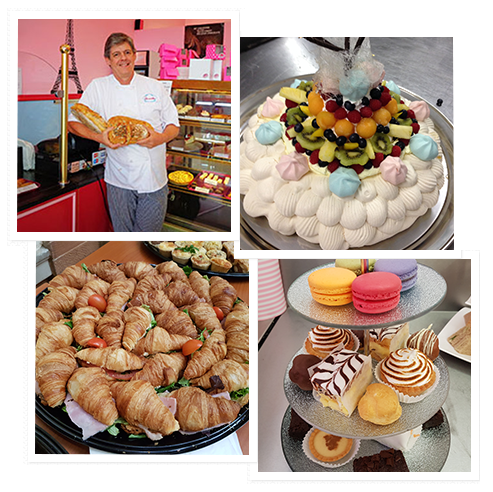 Patisserie de Paris offers off-site function catering, high teas, celebration and whole cakes, gluten free products, catering for bridal showers and wedding cakes, wholesale trade and soon, bread and baking classes. We’re also available on UberEats for your stay at home or office convenience.